Which is the Best Indicator for Forex Trading? The Best Indicator depends on what a trader or analyst is attempting to achieve. Indicators are comparable to a workman’s tool kit: every tool has a different function and it is important to choose the correct tool for the job in hand. Below we will discuss a few of the more useful indicators and how they can be used. Developed by Welles Wilder, ATR is an indicator that measures volatility. ATR can be used for calculating where to place stops, profit targets and position sizing. - Multiply the previous 14-day ATR by 13. - Add the most recent day's TR value. Moving averages smooth the price data to form a trend following indicator. A simple moving average is formed by computing the average price of a security over a specific number of periods. Most moving averages are based on closing prices. Moving averages are generally used to measure momentum and define areas of possible support and resistance. RSI oscillates between zero and 100. 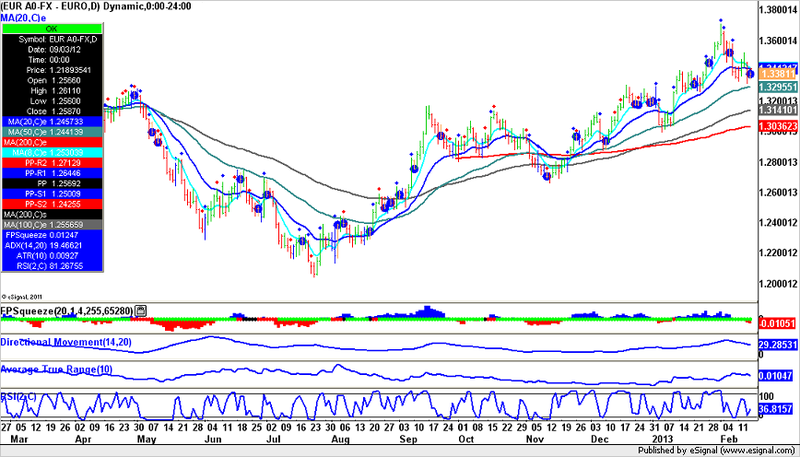 The indicator is overbought when above 70 and oversold when below 30. Signals can also be generated by looking for divergences. MACD (Moving Average Convergence/Divergence) is used to spot changes in the strength, direction, momentum and duration of a trend. In summary the Best Indicator with depend on your trading objectives. Once you have chosen the Best Indicator for Forex Trading as dictated by your trading objectives, you can view this indicator in your Forex Platform.